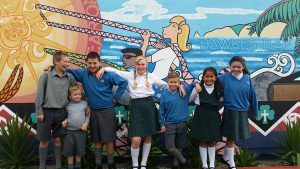 WelCom brings stories and news about Catholic communities in the Archdiocese of Wellington and the Diocese of Palmerston North. In this issue we continue our journey of faith visiting another of the many pastoral areas that form the two dioceses. This month we look at the Catholic Parish of Napier – Te Pārihi Katorika ki Ahuriri in Hawke’s Bay. The stories reflect its rich heritage and links to the early French Marist Missionaries and religious congregations that helped in missionary work to Māori and settlers, the establishment of parish and schools, and the growth in lay ministries as the parish continues its faith journey. Two years ago, on 27 March 2015, Bishop Charles Drennan decreed the beginning of the Catholic Parish of Napier – Te Pārihi Katorika ki Ahuriri – amalgamating the former parishes of St Patrick’s, St Thomas More and St Mary’s. Each of the former parishes has their own history. St Mary’s Parish, Greenmeadows, began in December 1850 when Fr John Lampila sm, accompanied by Br Florentin sm and Br Basil sm, arrived at Pākōwhai to establish a permanent Catholic mission station in Hawke’s Bay. In 1857 the Pākōwhai Mission Station moved to Meeanee and in December 1863 the Church of St Mary of the Assumption was blessed and opened by Bishop Viard sm at Meeanee. This marked the beginning of St Mary’s Parish. The church served the people of Pākōwhai, Meeanee, Taradale and Greenmeadows until the present church in Osier Road was blessed and opened by Cardinal McKeefry in October 1972. St Patrick’s Parish, Napier, was founded in 1859. St Mary’s chapel was blessed and Fr Euloge Reignier sm celebrated the first Mass in the chapel in March 1859. Fr Jean Forest sm was appointed the first parish priest. Bishop Moran of Dunedin, the Administer of the Diocese of Wellington, blessed the second church in August 1873. This church was relocated to Ahuriri and it was blessed and opened by Archbishop Redwood sm in July 1910. The third parish church, on Station St, was blessed and opened by Archbishop Redwood in November 1894. In August 1981 this church was completed destroyed by fire. The present church was blessed and opened by Bishop Peter Cullinane in March 1984. The first Mass for St Thomas More Parish, Onekawa was celebrated in February 1969 in Aquinas Hall on the present St Patrick’s School site. The first church – formerly the Napier Baptist church – was moved to the present site and was blessed by Cardinal McKeefry in August 1970. Fr Brian McAloon was the first parish priest. Bishop Peter Cullinane blessed and opened the present church in June 2003. During the time of the three former parishes, the parishes were ministered to by both Diocesan and Society of Mary priests. 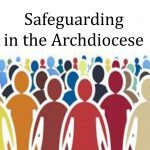 While acknowledging the presence of priests and religious, it is important to state in the context of any parish that it is the lay people who are the foundation – those who are the present parishioners, those who have died and those who will be the future generations. The emblematic representation of the Catholic Parish of Napier symbolises where we have come from, where we are at present and where we are going. The three shades of blue represent each of the former parishes and the present three faith communities. The dove represents the Holy Spirit as it guides us into our future as the Catholic Parish of Napier. The Catholic Parish of Napier celebrated its inauguration on Pentecost Sunday 2015. A new parish meant new parish staff members and new governance, as well as the creation of a new vision and mission, and a strategic plan to guide our new direction. After finding our feet, in early 2016 the CPoN’s four leadership teams of about 30 people – Parish staff, Pastoral Council, Liturgy Committee and Finance Committee – facilitated a planning group to develop a vision and mission for the parish. The group had a priest representative, a school representative and chairs of the pastoral, liturgy and finance committees. They developed and sent a draft parish vision and mission to parishioners for consideration and feedback. With amendments made the vision and mission were ratified in August 2016 and promulgated at Sunday Masses over the weekend of 24-25 September 2016. The planning group developed a strategic plan to implant the parish vision and mission and held consultation meetings with parishioners including our youth. Findings formed the basis for the draft strategic plan, which was shared with parishioners for feedback. It was finalised and approved by the leadership teams in January 2017. We are very excited to have a clear direction for our parish, and with God’s guidance we trust in our new journey. Mrs Kathleen Ellen Egan, of Napier, received Queens Services Medal in 2012 from then-Governor General Sir Jerry Matepara. This Ecumenical Social Service Agency was established in 1983 by the combined churches of Napier. Research had shown the need for a play group for disadvantaged mothers living in poor-standard homes, and for budget advice, counselling and family-support services. At the first AGM in 1984 the centre had a budget of $30,000 with about 100 clients. More than 30 years later, at the 2016 AGM, the budget was almost $4 million reaching 2500 families and involving 4000 people. Board members represent the mainstream churches and the agency now has a CEO, service managers, and an office manager with four staff. Services include home and centre-based early childhood and education as well as the counselling, home-based family social-work support and budgeting. The same care, love and gospel ethos, which pervades all the work carried out for over 34 years, continues for thousands of families. No person is turned away. Funding is secured through government welfare and education, grants, trusts and receipts. A community garden set up on the grounds of the centre in November 2016 is a source of great delight, especially the lettuces and spinach and fruit trees. Christmas brings the retail community and our parishes together, to help families with gifts of special food and presents. Staff and clients are overwhelmed by this generosity each year. Love abounds! A founding staff member, Kathy Egan, who has carried out many positions over the centre’s 34 years – including counsellor, family support worker, director and counselling manager – was honoured with a Pilot City Trust award for services to the community in 2011. 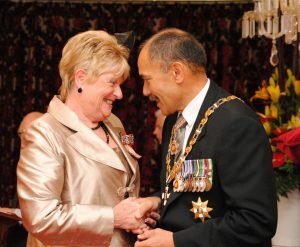 In 2012 she was awarded a Queen Service Medal for services to the community, mostly for her work carried out at the Napier Family Centre. Kathy now facilitates the Parish’s Christian Meditation Group. 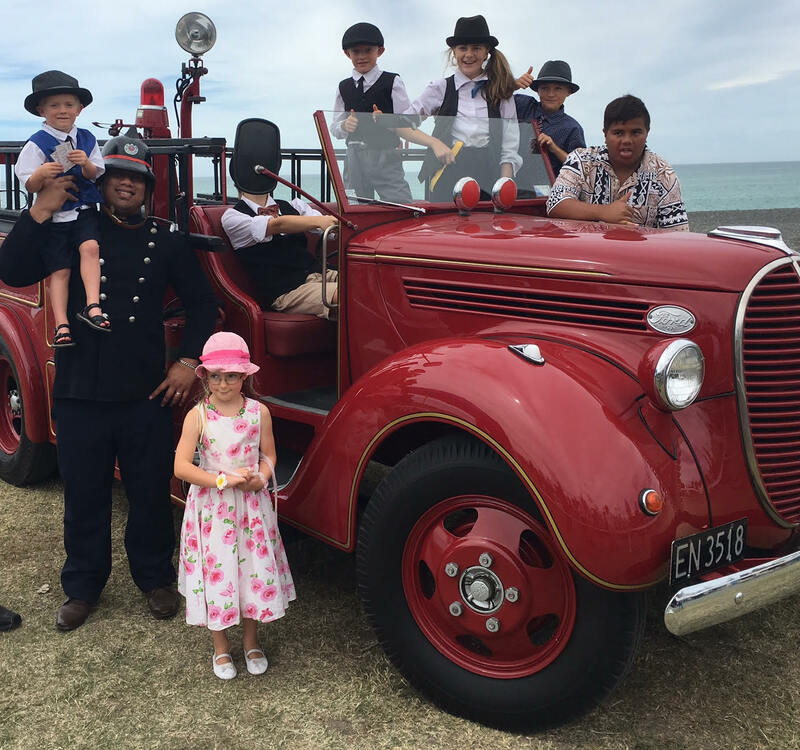 Young parishioners with dress up for Art Deco weekend. Napier’s youth group is very active within the parish. 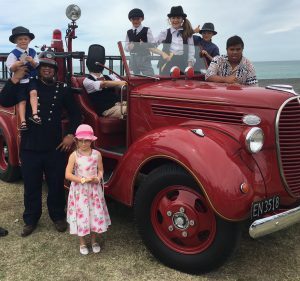 In February they were involved with the Gatsby Morning Tea at St Patrick’s Church as a part of the annual in the Art Deco weekend. Mass beforehand was celebrated with Art Deco vestments with many parishioners dressed up for the occasion. After the 1931 Napier earthquake the city was rebuilt with art deco architecture, which today attracts many visitors. In February the youth group also put on a Pool Party – Making a Splash – at the Napier Aquatic Centre with great fun on the water slides, followed by a bbq. As part of the Care of Creation group’s focus they joined in the helping beach clean up for Sea Week in March. On Good Friday, 14 April, they will take part in the ‘Parish Ecumenical Cross Walk’ starting at St Patrick’s at 9.30am. They then go to the beach for Easter-themed activities and fish and chips! Another important occasion is Confirmation this year with Bishop Charles Drennan on 25 June. A weekly preparation programme will run over eight weeks in Term 2. These are just a few of the Catholic Youth Alive events for Napier. We are open and welcoming to any new young people (or young at heart) to join us. 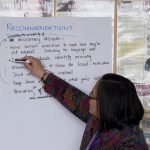 Follow us on the CPON website (cpon.org.nz) or on our Facebook page. 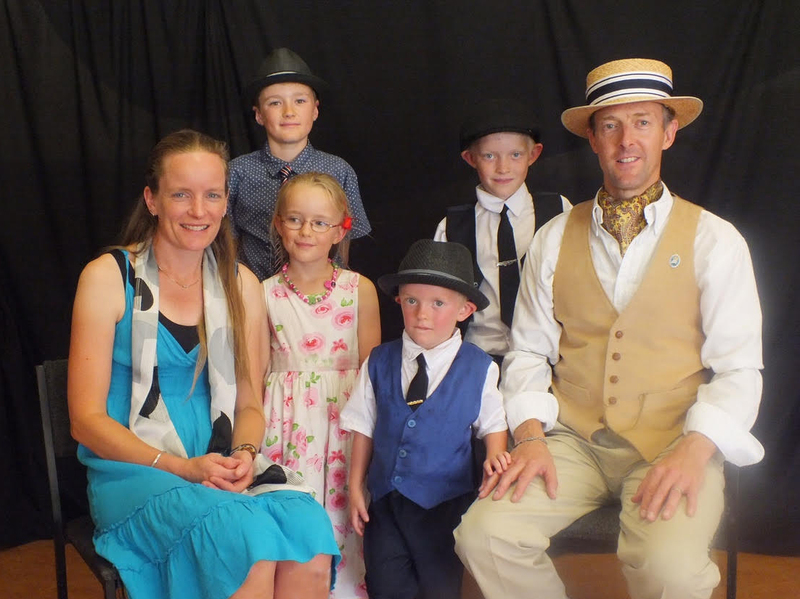 Chris Marwick, Youth Coordinator, Dressed up for Art Deco Mass with his family, 2016. At the beach after the ‘Ecumenical Cross Walk’. 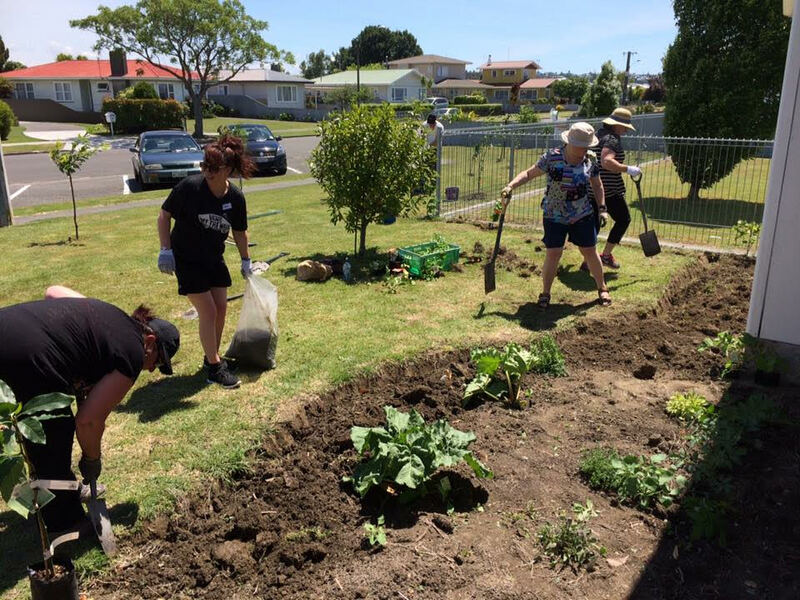 For over 25 years St Mary’s in Napier, part of the amalgamated parish, has kept in touch with parishioners on its roll by volunteers visiting every household – apart from some in the rural areas. Twice a year, around 30 visitors visit seven households each – that’s 420 a year. Homes receive a personal visit about every two years to say hello, keep in touch, and listen to any concerns or needs. Visitors are not a substitute for the parish priest. The reason is simply to show the parish cares for all its people. This ministry builds community, friendships and up-to-date connections. Another team ensures every parish household receives a hand-delivered newsletter, in St Mary’s area (which is also online www.cpon.org.nz). It is another great evangelising tool and an effective way of keeping in touch throughout the year. 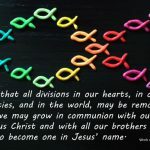 For the last 30 years Catholics, Anglicans, Methodists and Presbyterians have been part of a Covenant that unites them in witness to Christ and to serve their churches and community as they celebrate God’s presence among them. They pray for each other’s congregations at Sunday services, communicate regularly and come together for church and community observances. Our conference was established in 1947 and today we have 17 members. With a new president and secretary many new members are joining. We work with disadvantaged people in the area, offering hospitality, home visits, food, clothing, firewood, hospital visiting, financial support, love and care. We are financially supported by an annual collection at Masses, and donations from our members and parishioners. St Mary’s community is amazingly generous giving us the ability to assist many people struggling financially with necessities such as power, doctor’s appointments and school needs. Tremendous parish support is received each year at Christmas, with donations going to the Angel Tree Trust for prisoners’ children. Our new ministries in 2017 include a surrogate grandparent service to young families, more visitors to the prison for Sunday services and, after training from our Hospice, caring for the carers – helping caregivers with family at home living with cancer. Napier Parish celebrates the annual World Day of Prayer for Care of Creation on September 1, after Pope Francis’ invitation to Catholics in 2015 to affirm the day as responsible stewards of God’s creation. Last year in Napier the day took the form of a prayer service with Eucharistic Adoration. We’ll celebrate this year with our Catholic colleges. It is an opportunity to thank God for his wonderful creation entrusted to our care and to ask for His help to protect our environment. The day is one of several initiatives by our small Care of Creation parish group, which started after workshops were attended by over 50 parishioners on Pope Francis’ Laudato Si’ letter about care for our common home. 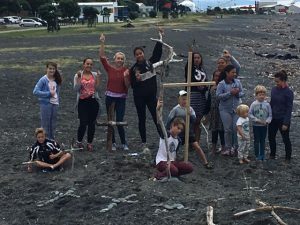 The group promoted parishioners to join with our Anglican sisters and brothers for a beach cleanup and picnic in March this year, and it has organised formation in eco-spirituality sessions during Lent by Fr Neil Vaney sm. It has worked with our Catholic primary schools on an environmental fair in March and it publishes monthly eco tips in the parish newsletter. In October this year, St Joseph’s Māori Girls’ College, Greenmeadows, will celebrate its 150th jubilee. Preparations to mark this wonderful event are underway. 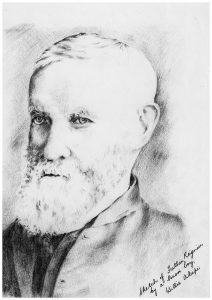 On 10 October 1867, Fr Euloge Reigner sm realised his dream of a Catholic education for Māori girls by opening St Joseph’s Providence School on Napier’s ‘holy hill’ (the Bluff). Sisters of Our Lady of the Missions staffed the school. Fr Reigner and Bishop Viard had purchased land near the Convent with the help of Fr Forest and local people to provide the school buildings. In 1869 responsibility of the school was handed over to the Sisters. For Euphrasie Barbier, foundress of this new Congregation, it was also a dream fulfilled – to bring Christ to the tangata whenua through the education of women and children. She explicitly expressed the desire that the ‘work with the Māori should be a success’. The work of the early school flourished. Fr Reignier frequently called with more little girls he found either abandoned or neglected and brought them to the Sisters. In 1935 the College was re-located to its present site in Greenmeadows. The Sisters worked tirelessly to offer a high standard of education for the girls. In 1945 the College was granted full Post-Primary Registration by the Education Department. In 1987 past pupil Dame Georgina Kingi was appointed as the first lay principal. The Marist community serves the new Catholic Parish of Napier – Te Pārihi Katorika ki Ahuriri. The Windsor Terrace community in Taradale is home for a number of retired clergy. 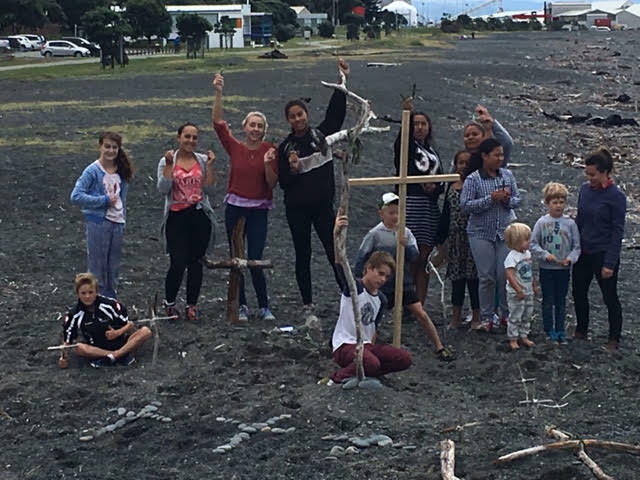 A priest from the community continues to work with the Māori community in the area. 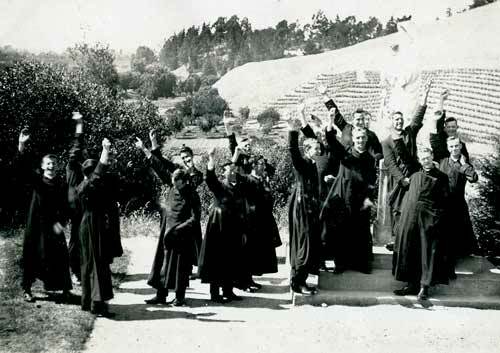 The other residents fulfil their commitment to the Society of Mary through prayer and fraternal support. Maryknoll, a community established in 2013 on the Mount St Mary’s Mission property, began with the intention of being a tūrangawaewae for Marists and a house of hospitality. This recognises the work of the early Marist Mission in establishing the Catholic church, a seminary and the Mission vineyards in this area. The community helps out in the parish as needed and follows Mary’s advice given at Cana ‒ indicating her Son ‒ she said, ‘Do whatever he tells you’. On 25 February 1865 four French sisters arrived in Napier to work with the Marist fathers, the first of whom had arrived in 1838 with Bishop Pompallier. 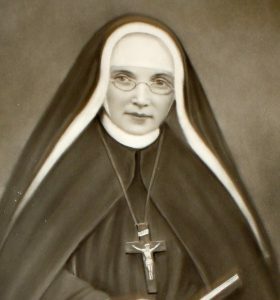 Four years earlier in 1861, French woman, Euphrasie Barbier, had founded the Sisters of Our Lady of the Missions; its specific role being the education of women and children. Houses were also established in Christchurch, Nelson, New Plymouth, Hamilton, Kaikoura, Leeston and Opotiki. 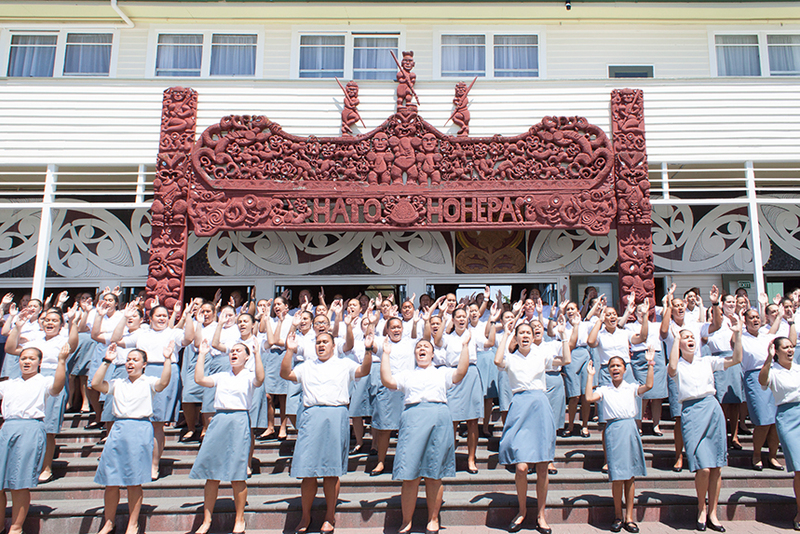 The Sisters in Napier, with the support of Fr Euloge Reignier sm, opened the Providence for Māori girls, later renamed as St Joseph’s Māori Girls’ College. 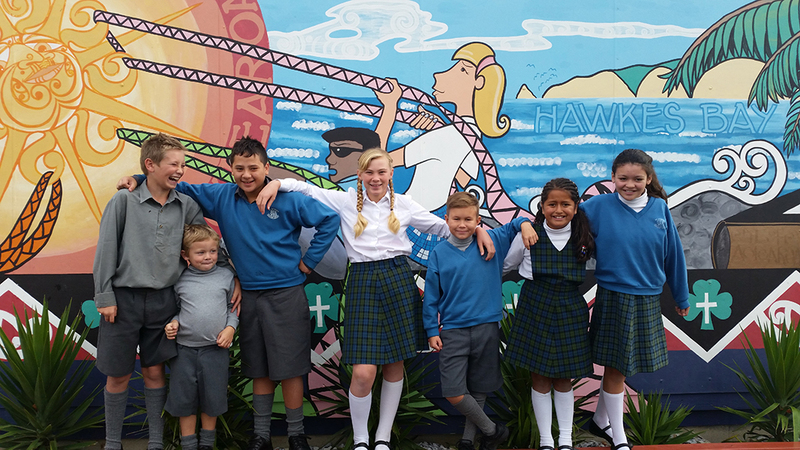 St Patrick’s School in Napier is a jewel in our Catholic Education system for Year 1–8 students and their families. The school, in the heart of the ‘Art Deco’ district, caters for a cross section of socio-economic and ethnic groups. Our strength lies in our cultural diversity and caring relationships within the school community. Education at St Patrick’s is modern and inclusive. The roll is 340 and growing rapidly. We have 18 teachers, a deputy principal and 11 support staff. The original school was established in 1878 and was a Marist Brothers’ school for boys until the 1980s when it amalgamated with the Sisters of our Lady of the Missions to become St Patrick’s, a co-educational school for Years 1–8. And that’s what makes St Patrick’s the wonderful school it is. Come and visit and see for yourself. There are no strangers here, only friends you have not met. The Sisters of Our Lady of the Missions founded Sacred Heart College Napier in 1867. The college is on Napier Hill overlooking Hawke’s Bay. The charism and legacy of foundress, Euphrasie Barbier, empowers our young women in their journey of life-long learning – a journey with ‘hearts and minds in harmony’. 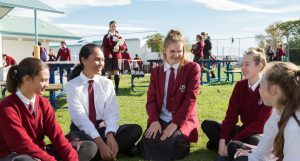 The school has three key aims: to sustain and enrich our Catholic character throughout school life; to maximise learning opportunities to realise the potential and raise the capacity of every student; and to actively engage in effective teaching and learning strategies that promote life-long learning. We enrich students’ faith journeys through liturgies of prayer, music, dance and drama. Retreats provide students with ‘time out’ to reflect on the important issues in their lives. Our school motto is ‘Virtue and Knowledge’. The school reflects this and its special Catholic character through service, justice, peace and love and a commitment to treating all with dignity. It also reflects the teachings and actions of Jesus Christ in a changing world – bringing the life of the Sacred Heart into the hearts and minds of our school and parish communities. 2017 marks the 150th Jubilee year with the theme In her Footsteps honouring the vision of Euphrasie Barbier. Students outside their school, Reignier Catholic School. We have just over 200 pupils at Reignier Catholic Primary School in Greenmeadows. Our values of respect, community, excellence, integrity and justice are woven into our Catholic special character preparing our learners well for their future lives. Our school began in Meeanee by French Māori Missionary, Fr Euloge Reignier. It was originally built in 1873 as a boarding and day school known as St Mary’s. It was to be a boys’ equivalent of St Joseph’s Māori Girls’ College but it gradually became a co-educational primary day school. It was staffed by the Sisters of St Joseph from 1886 until 1924. Due to extensive flooding, a new school was opened in Guppy Road in 1926, staffed by the Sisters of Our Lady of the Missions. It was called St Joseph’s Primary until 1974 when its name changed to Reignier School. We still celebrate St Joseph’s feast day on 19 March and our motto and emblem incorporates Virtue and Knowledge recognising the Mission Sisters’ early influence. The school has also had a long association with the Marists priests and seminarians. Reignier school has a rich family history with generations of local families having attended since its early days. Suzanne Aubert was in Auckland when she was invited by Fr Reignier in 1871 to go to Napier. French priests, Frs Reignier and Michael welcomed her on arrival. They lived on the Māori Mission at Meanee with the Marist Lay Brothers. Suzanne wrote that they treated her with kindness. While there she became involved in the mission to Māori throughout the wider Hawke’s Bay area. She was known as Meri Hōhepa (Sr Mary Joseph) and was the mainstay of the Mission in Hawke’s Bay as a catechist, school teacher, nurse, prayer-book reviser and musician. In Napier Suzanne developed her herbal medicines, nursed the sick and cared for the dying. When she left Hawke’s Bay in 1883, Airini Donnelly of Ngāti Kahungunu wrote that Suzanne had a great love for her and her people. Suzanne Aubert left Hawke’s Bay to help Fr Soulas revive the mission at Jerusalem. 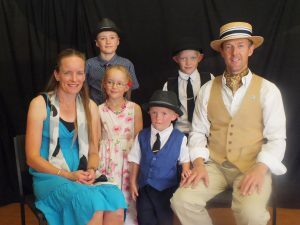 Years later, looking back at the 12 years she spent in Hawke’s Bay, she said they were the happiest years of her life.